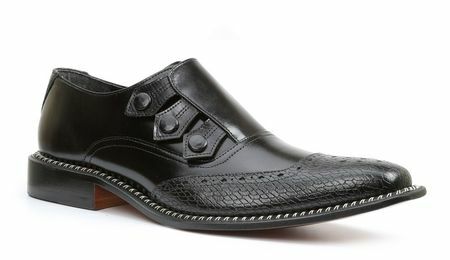 If you're trying to dress for an old school night or just appreciate the way dress shoes from the 1920s and 1920s look, these black triple snap leather dress shoes from Giorgio Brutini will make it happen for you. Made of rich black calf skin leather combined with black lizard print leather, these spectator shoes have that vintage 1930s sort of look with an exotic twist at the same time. Plus, because they are Giorgio Brutini shoes, they fit great the first time and every time. Available in medium width.